The robot, ready to do your bidding. Necessary wifi dongle not shown. 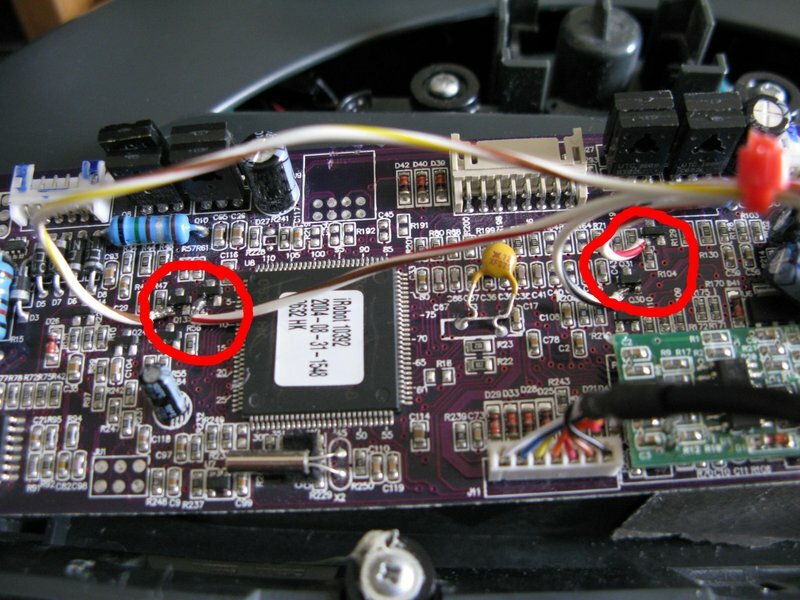 The four small transistors I mentioned are circled in red. Behold my soldering! They’re labeled Q13, Q14, Q30 and an un-labeled one near R129. I had a little help in discovering this from a video that a man named Dean Segovis had posted on YouTube, but I ended up taking a multimeter to the board; just to make sure that I wasn’t hooking my precious pi up to anything dangerous. You can watch Dean’s video here: https://www.youtube.com/watch?v=TVp6QWcoilk. Once I had confirmed the location of the transistors I needed on the board, I connected their bases to GPIO pins 4, 17, 18 and 21 on the Raspberry pi with with a 16 pin socket that I had lying around. To power the Raspberry Pi, I soldered together a power supply circuit around a 1 amp 5 volt regulator (basically the regulator and two capacitors) on a piece of perf board and had the 5v output from the regulator run to a micro USB connector. I also added some miscellaneous components to the circuit, like a power switch, a 2.5 Amp fuse, a 12 volt in socket and some 12 volt out sockets; one of which the camera is plugged into. 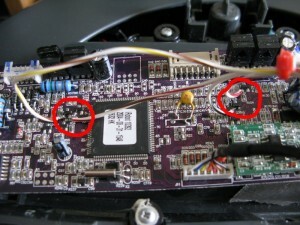 The roomba’s main board is also plugged into a 12 volt out socket. 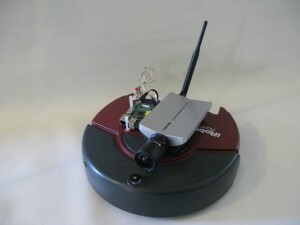 For the camera, I just used an ip network camera from the company Vivotek. I had tried to use a USB webcam that you might use for skype calls, but streaming video from the pi slowed it way down and the picture quality wasn’t as good as I had wanted. I wasn’t using the best webcam in the world, though. and one near the SD card slot. This makes it easy to remove the Pi from the robot when It isn’t in use, yet it holds it in place very well. 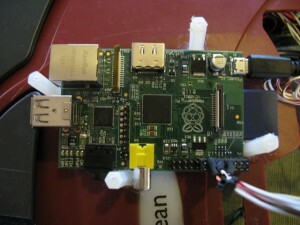 The ‘holder’, with Rpi inserted. The entire robot is powered off of a small 12 volt lead acid battery that fits nicely into the slot where the roomba’s original battery went. I could have used the original battery, but the one that came with my roomba was extremely old and wouldn’t take a charge any more. .
And I think that’s about it. If I was unclear about anything or if you want a more detailed description of my project, please email me at benhjake (at) gmail.com , or leave a comment below. Also, if you replicate my project, I’d love to see a picture or two. You could email those to the same address. Thanks, and Happy Hacking!